While many abstract paintings are about expression or purity, 180 Colors is about nothing so lofty. Richter used a systematic approach to determine the rich variety of colors: he produced its 180 different colors by combining the three primary colors to get twelve hues and then mixing fifteen tones of each varying from light to dark. The surface, composed of glossy enamel paint, is flawless and shiny. Another key element of this painting is literally not there at all: From a distance, an optical illusion of gray dots seems to hover at the corners of the colored blocks. By presenting 180 color blocks set into a grid of raw canvas, Gerhard Richter laid bare the means of painting as a scientific enterprise. Starting by combining the three primary colors into twelve base colors, Richter followed the possible permutations by mixing fifteen hues of each, from light to dark. The shiny, flawless surface of the enamel paint squares against the untreated background further distills the empirical logic that governs the work, likening it more to a color chart or a sample kit than to a narrative or expressive painting. Such explorations of the potential and limits of painting have established Richter as one of the most influential living artists. Erica Battle, from Philadelphia Museum of Art: Handbook. Philadelphia: Philadelphia Museum of Art, 2014, p. 377. 180 Colors is one of a set of four multicolored paintings, each bearing the same title, that Richter showed at the 1972 Documenta, the international art exhibition held in Kassel, Germany. 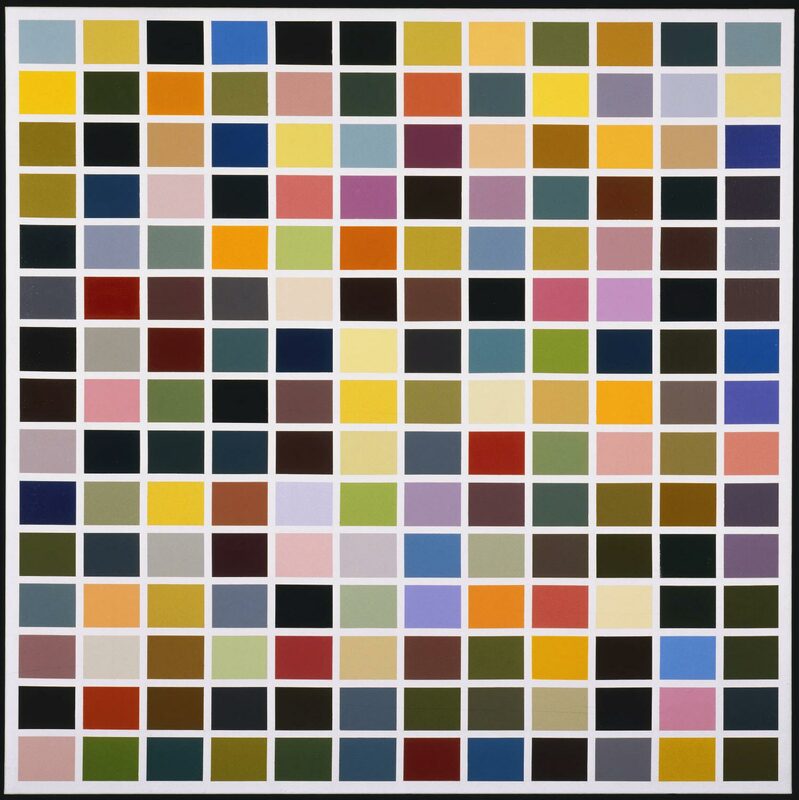 The artist began his investigations into the complex permutations of color charts in 1966, with a small painting entitled 10 Colors. That work was produced in reaction to Pop art, in particular the paintings of Andy Warhol and Roy Lichtenstein, who enthusiastically adopted commercial techniques and subject matter drawn from consumer culture. The subsequent series of paintings was based on the color charts that are shown to customers by paint suppliers to help them choose the colors they want for their home. Richter transformed the handy-sized, industrially manufactured paint swatches into huge tableaux as a way of exploring the potentials and limits of painting, linking his work with the concerns of Conceptual art and Minimalism. In 180 Colors, Richter confronts us with a composition made up of 180 blocks of color. Each rectangle has an even coat of glossy enamel and is framed within the white grid of the bare canvas, which resembles an enlarged page from a paint sample book. Inspired by the formulas used by paint suppliers to mix any number of colors, the artist used a mathematical equation to create his picture. Richter twice mixed the three primary colors—red, yellow, and blue—to get 12 hues (3 x 2 x 2 = 12). Then, from each of those 12 hues, he mixed 15 varying tones from light to dark to make 180 colors (12 x 15 = 180). The mathematical precision with which the colors were mixed contrasts with Richter's coincidental arrangement of the color patches. The arbitrary juxtaposition of colors coalesces in the same way that a random selection of numbers will line up to win a game of bingo. As Richter explained: "Colours match the same way as the right bingo numbers will. . . . Any sequence of numbers is always right and credible if it is the correct one. "1 Twentieth Century Painting and Sculpture in the Philadelphia Museum of Art (2000), p. 136. 1) Quoted in Gerhard Richter: Paintings, by Roald Nasgaard (London: Thames & Hudson, 1988), p. 77.